All prosperity begins in the mind and is dependent only upon the full use of our creative imagination. Finding the perfect quote for this candle took a while. 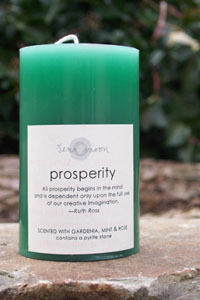 Most quotes seem to equate prosperity with greed, which is not in the spirit of this candle. To my mind, prosperity means to flourish, to bloom; to both give and receive the riches of life~spiritually, emotionally, economically. This quote captures my staunch belief that the higher we value ourselves and others, the more we're valued through and through. As Ellen DeGeneres says, "Sounds easy. But is it?" Well, no, at least not for me. But I'm chugging along. And this candle helps keep me on track.